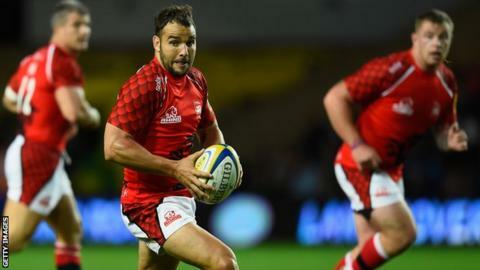 Former England fly-half Olly Barkley says a feeling of unfinished business was behind his decision to sign a new deal with relegated London Welsh. Barkley, 33, has started just eight of Welsh's Premiership games this season and has made 12 appearances in total. The club will play in the Championship next season after just one campaign in the top flight. "I felt leaving the club on this note would have been a failure on my part," Barkley said. He added: "When I signed a year ago I had a very strong idea about what I wanted to achieve at this club. "When you get a little older you get a little bit more philosophical about your contribution to the team and your priorities and focus change. "I wanted to be a big part of laying a foundation in the Premiership for this club. That definitely hasn't happened." Won 23 caps for England, scoring 82 points including two tries. Has scored 1605 points in 193 Premiership appearances. Started three games at the 2007 World Cup. Barkley, who won 23 caps for England, began his career at Bath and made 162 appearances for the club over two spells and also played for Gloucester. Despite a disappointing season with Welsh, Barkley says he still has the hunger to perform for the Oxford-based club. "I enjoy being here despite it being a tough year," he told BBC Radio Oxford. "I enjoy being around the boys and coaches and hopefully we can turn it around next year. "It's been a stop-start season with illness and injury. I haven't had the consistency so that's something I want to do next season, get out there and contribute to the team."